National defense expenditure empowers the armed forces to guard the lives of each citizen and maintain the nation's security and development. The military budgets of major countries indeed have impact on the world order as a whole. It is therefore unsurprising that China's annual defense budget draws global attention. Spokesperson for the National People's Congress (NPC) Fu Ying announced at a press conference on March 4, during the annual "two sessions" of the NPC and CPPCC, that China's national defense budget in 2017 would increase to approximately RMB 1 trillion (US $145 billion), a year-on-year rise of about 7 percent. We include in this month's China Today the following interview with Qian Lihua, a member of the National Committee of the Chinese People's Political Consultative Conference (CPPCC) and former director of the Foreign Affairs Office of the Ministry of National Defense. He spoke with our reporter about China's national defense expenditure and elaborated the role of the Chinese armed forces in safeguarding national security and maintaining world peace. While talking about the increase in China's national defense expenditure, Qian Lihua clarified his explanation with relative statistics from 2010 through to the present. National defense expenditure rose 7.5 percent in 2010, and maintained double-digit growth for five consecutive years from 2011 to 2015. In 2016 and 2017, however, those figures reverted to single digits. In 2016, China's national defense expenditure totaled RMB 954.354 billion, with 7.6 percent growth year on year. In 2017, the further seven percent increase will bring this amount to RMB 1 trillion. These statistics show that the 2017 increase in national defense expenditure is the lowest since 2010. "Do more with less" is China's fundamental principle, in expectations that both military and economic benefits might be maximized. Qian Lihua explained the great importance that China always attaches to appropriate national defense expenditure. The country insists on coordinated development between national defense and the economy, controlling the scale of expenditure, and maintaining a moderate annual increase in line with the demands of national defense and military reforms. To clarify China's military expenditure scale, Qian Lihua compared the world's two largest economies – the United States and China. The U.S. national defense budget was US $597 billion in 2016, and in 2017 it rose to US $618.7 billion. President Trump even plans to add a further US $54 billion dollars to the military budget in 2018 – a 9.3 percent increase. When considering what percentage of a country's GDP is taken up by national defense expenditure, statistics show that China's military budget usually accounts for about 1.3 or 1.5 percent, while that of the United States is generally 3.4 percent. China's military expenditure per capita is also substantially lower than that of the United States. 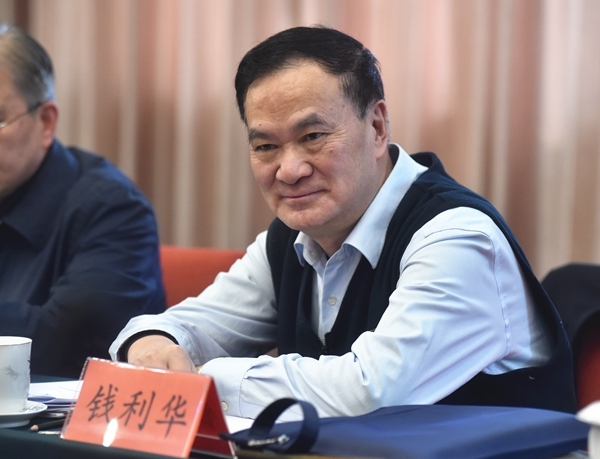 Qian Lihua noted that national defense expenditure is determined in accordance with the country's security strategies and national defense policies. The U.S. aims to build a military force which can implement its global security strategies and be deployed abroad. China's military, however, focuses on safeguarding the country's sovereignty, security and national interest, and development, so upholding a national defense policy that is purely defensive in nature. Despite the increases in the current budget and areas to which military investment is allocated, China's national defense expenditure remains committed to its defense policy. National defense expenditure empowers the armed forces to guard the lives of each citizen and maintain the nation's security and development.